THERE’S FRIDAY NIGHT football at Goodison Park with fifth-place Everton hosting Crystal Palace, who currently lie two points back in seventh. The Toffees have begun life under Ronald Koeman really well but saw their unbeaten league run come to an end away to Bournemouth last weekend. That said, of their last five Premier League games at home, they have won four and drawn the other. Alan Pardew’s Eagles have been victorious in their last three league matches but they look a little suspect defensively and haven’t kept a clean sheet all season. The game also sees two Belgian strikers pitted against each another and while Romelu Lukaku (four goals in five) has a slightly better return than Christian Benteke (two goals in four), backing the former Liverpool man to score first at 7/1 will earn you a larger return than his countryman (16/5). Some people questioned Liverpool’s decision to pay Southampton £34 million (€40m) for Sadio Mane in the summer, but the Senegalese winger has proved any doubters wrong by adding a new dimension to the Reds’ attack. With three goals and three assists in all competitions, the 24-year-old was named PFA Fans’ Player of the Month for August and September and we believe he’ll have a major hand in an away win against Swansea at the Liberty Stadium on Saturday. It’s been a mixed few weeks for Chelsea after their impressive start to life under Antonio Conte. Arsenal and Liverpool have dished out consecutive league losses to the Blues and their Italian manager has admitted “there’s no magic wand” to change the situation. However, the Londoners are unbeaten in all eight Premier League meetings with Hull City, who went down 5-1 to Liverpool last time out, and they should get back to winning ways. West Brom pay a visit to the Stadium of Light to take on bottom-placed Sunderland, who already appear destined for another relegation scrap, and the Baggies can heap more pressure on Black Cats boss David Moyes on Saturday. Current champions Leicester are in action on Sunday after clocking up their second Champions League win on the trot in midweek. The Foxes, who have been inconsistent in the league, welcome Southampton to the King Power Stadium. Claudio Ranieri’s side have already been involved in high-scoring games against Manchester United, Chelsea, Liverpool, Burnley and Club Brugge this term so consider sticking a few euro on over 3.5 goals here. The Premier League’s top two, and the only sides sides still unbeaten, face off at White Hart Lane on Sunday afternoon. Both teams are missing a key player, as Kevin de Bruyne and Harry Kane are sidelined with injuries, but it’s still an intriguing match-up. Under Pep Guardiola, City have a 100% record in the league, but Spurs have only conceded three goals in their opening six matches and we’re going for a draw. Email “Mane to strike it lucky for the Reds and this weekend's Premier League bets ”. 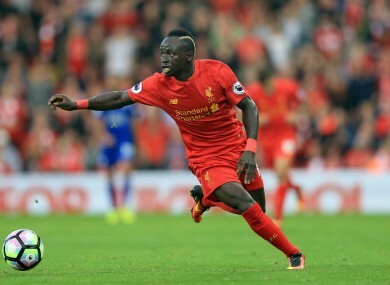 Feedback on “Mane to strike it lucky for the Reds and this weekend's Premier League bets ”.